Local girl Kate Derwin had two reasons to celebrate this week, after coming home from the European Pony Jumping Championships in Hungary with a gold and silver medal. 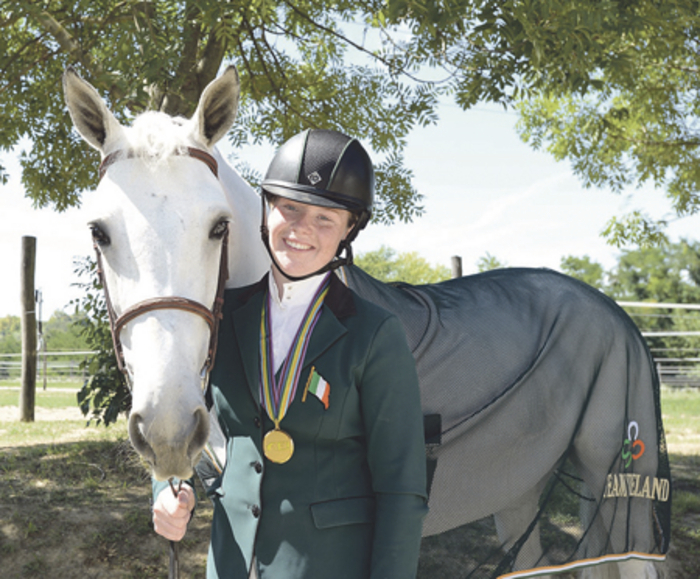 The 15-year-old Athlone student secured an individual silver medal on Irish Connemara superstar pony Cul Ban Mistress, while the Irish Pony Show jumping team achieved gold-medal success. It was a proud moment for Kate as she climbed the podium to receive her medals and sing ‘Amhrán na bhFiann’. Speaking on Tuesday this week, Kate expressed her joy at bringing home two medals. Standing outside Derwin’s Auburn Equestrian Centre off the Dublin Road in Athlone, Kate reflected on the long road of sacrifice and dedication which has led her to this recent triumph. Kate added that she could not have achieved what she has without the strong support base she enjoys.